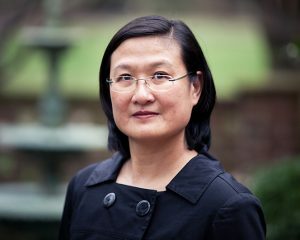 The daughter of a refugee father from China and an immigrant mother from Jamaica, Jennifer Ho first came to UNC Chapel Hill as a postdoctoral fellow for faculty diversity (2003-2005) and joined the Department of English as an Assistant Professor in 2005. She teaches courses in Asian American literature, multiethnic American literature, and Contemporary American literature, and her research interests are in critical race theory, anti-racism, and narratology. Ho is the author of three books, Consumption and Identity in Asian American Coming-of-Age Narratives (Routledge Press 2005), Racial Ambiguity in Asian American Culture (Rutgers University Press, 2015), which won the 2016 South Atlantic Modern Languages Association award for best monograph, and Understanding Gish Jen (University of South Carolina Press 2015). She is co-editor (along with James Donahue and Shaun Morgan) of a collection of essays on race and narratology, Race, Ethnicity, and Narrative in the United States (OSU Press 2017) and a series of teaching essays on Asian North American literature, Teaching Approaches to Asian American Literature (forthcoming MLA, co-edited with Jenny Wills). She has published in journals such as Modern Fiction Studies, Journal for Asian American Studies, Amerasia Journal, The Global South and has also presented at conferences such as the American Studies Association, Modern Language Association, American Literature Association, and the Association of Asian American Studies. Two of her current book projects are a breast cancer memoir and a family autobiography that will consider Asian Americans in the global south through the narrative of her maternal family’s immigration from Hong Kong to Jamaica to North America. *2015, Best Monograph Book Award, South Atlantic Modern Language Association. *Fall 2015-Spring 2016, Academic Leadership Program, Institute for the Arts and Humanities, University of North Carolina at Chapel Hill. *Spring 2010, Distinguished Publication by an Assistant Professor, Department of English and Comparative Literature, University of North Carolina at Chapel Hill. *Summer 2009, Center for Global Initiatives Course Development Grant, University of North Carolina at Chapel Hill. *Summer 2009, APPLES Uelteschi Service Learning Course Development Grant, University of North Carolina at Chapel Hill. *Spring 2008, Institute for the Arts and Humanities Fellowship, University of North Carolina at Chapel Hill. *2007-2008, Junior Faculty Achievement Award, University of North Carolina at Chapel Hill. *2006-2007, Spray-Randleigh Fellowship, University of North Carolina at Chapel Hill. *Summer 2006, Provost’s International First-year Seminar Course Development Grant, University of North Carolina at Chapel Hill. *Summer 2006, Honors Course Development Grant, University of North Carolina at Chapel Hill.